The 2018 RIBA Stirling Prize has been awarded to Bloomberg by British architects Foster + Partners. 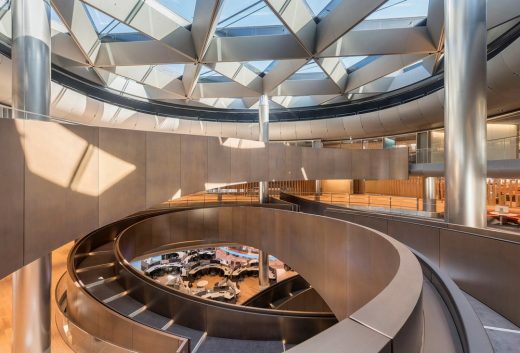 Described as a tour-de-force, this project occupies a whole block within the city and houses all of Bloomberg’s employees under one roof for the first time. The Royal Institute of British Architects (RIBA) has awarded the 2017 RIBA Stirling Prize, sponsored by Almacantar, to Hastings Pier by dRMM Architects. The RIBA Stirling Prize, now in its 22nd year, is awarded annually to the UK’s best new building. Hastings Pier, on the East Sussex coast and overlooking the English Channel, can chart its history from 1872. For many years it was a popular pleasure pier famous for musical acts, but its recent past has been much more precarious. Neglected for years, it closed in 2008 following storm damage, and in 2010 faced destruction when a fire ravaged the entire structure. Residents and supporters were determined to use the fire as an opportunity to reimagine the pier. Buoyed by the help of the Heritage Lottery Fund, a RIBA design competition attracted entries from around the world. London-based architects dRMM won the competition and immediately set about close consultation with locals and stakeholders, quickly reaching the conclusion that the pier must serve a wide variety of scenarios to be sustainable. 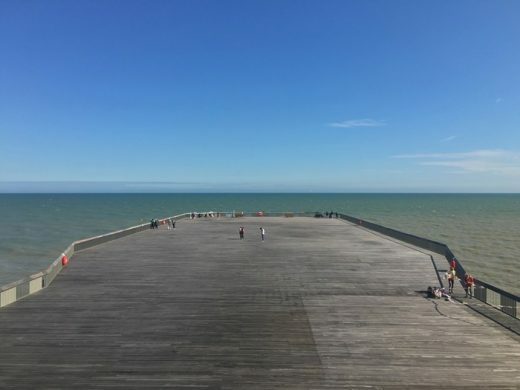 Additional fundraising from a local action group found 3,000 shareholders to buy a stake in the project at £100 a share – this is the people’s pier. 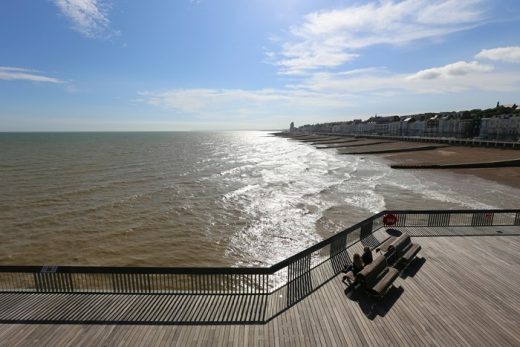 The new-look Hastings Pier has been repaired and rebuilt, then creatively reimagined. The 19th century structural iron work, hidden below deck, has been painstakingly restored and strengthened following years of neglect, storm and fire damage. The surviving Victorian Pavilion, one of two buildings on the Pier, has been transformed into an open plan, glazed café-bar. The vast pier deck has been set aside as an uninterrupted flexible expanse for large-scale concerts, markets and public gatherings. The new timber-clad visitors centre building in the centre of the pier, has a viewing deck on its roof providing a dramatic space for visitors to experience epic views along the coast and across the English Channel. The architects have used timber throughout the project, much of it reclaimed from the original pier: the visitors centre makes a feature of its scorched wood cladding. The reclaimed timber has also been used to create the pier’s striking new furniture, manufactured locally as part of a local employment initiative. “Hastings Pier is a masterpiece of regeneration and inspiration. The architects and local community have transformed a neglected wreck into a stunning, flexible new pier to delight and inspire visitors and local people. Hastings Pier showcases the remarkable skills, tenacity and problem-solving flair of its talented architects, dRMM. It also rewards the patrons of this great architectural achievement: the local people who have taken the initiative, and risk, to create this highly innovative and extraordinary new landmark. “dRMM Architects were delighted to collaborate with Hastings Pier Charity on this ambitious project which, like a ‘Phoenix from the ashes’, was realised through dedicated community action. The new pier is designed as an enormous, free, public platform over the sea – inspiring temporary installations and events across a variety of scales. This space offered more potential than an ‘iconic’ building on the end of the pier, and demonstrates the evolving role of the architect as an agent for change. All of the many people who worked on this long project are grateful to have received the prize – and proud of achieving the apparently impossible”. 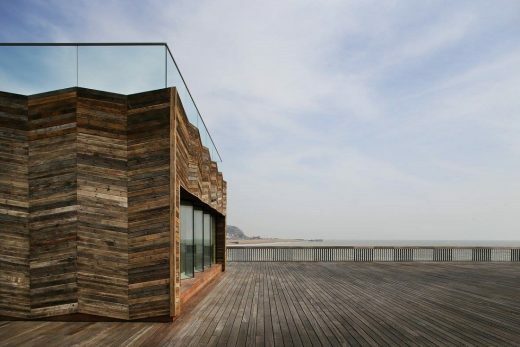 “Hastings Pier is a project that has evolved the idea of what architecture is and what architects should do. dRMM’s role has been utterly pivotal in realising this masterpiece of subtle, effortless design. They have driven this project through to completion: campaigning, galvanising and organising local support throughout each aspect of the funding stage. They went above and beyond what most people think of as the role of the architect – and then they kept going! dRMM show what incredibly talented and dedicated architects can do: inspire, think big, interact and engage with communities and clients to help them to achieve the seemingly impossible; this is a great message for young architects following in their footsteps. The vital importance of building sustainably runs throughout the RIBA’s awards, and Hastings Pier deserves special recognition for its remarkable use of sustainable materials and positive social impact. The architects have designed a process as much building, and have designed the Pier to evolve and grow. 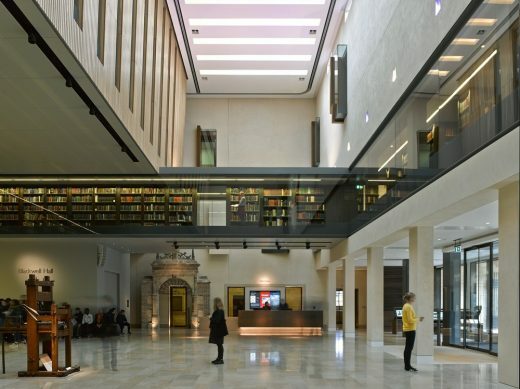 The judges for the 2017 RIBA Stirling Prize were: RIBA President Ben Derbyshire (Chair), Anupama Kundoo – Anupama Kundoo Architects, Peter St John – Caruso St John Architects, Evan Davis – Journalist & BBC Presenter and Jane Hall – Founding member of Assemble. •	The Houseboat by Mole Architects and Rebecca Granger Architects won the 2017 Stephen Lawrence Prize. The prize, set up in memory of Stephen Lawrence who was setting out on the road to becoming an architect before his tragic and untimely death in 1993, and supported by the Marco Goldschmied Foundation, is intended to encourage fresh architecture talent and reward the best examples of projects that have a construction budget of less than £1 million. •	Bedales School won the 2017 RIBA Client of the Year, supported by The Bloxham Charitable Trust. The award recognizes the role good clients play in the delivery of fine architecture. We are also pleased to announce that Almacantar, the property investment and development specialists and sponsors of the RIBA Stirling Prize since 2015 have renewed their support of the Institute for a further three years (2018 – 2020). Winner to be announced on Tuesday 31st of October 2017. 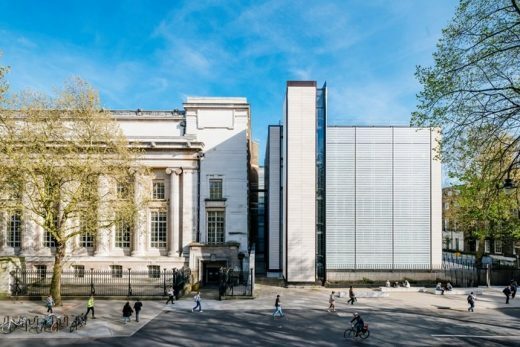 Six buildings are on the shortlist for the 22nd annual Royal Institute of British Architects (RIBA) Stirling Prize for the UK’s best new building. The bookies favourite is currently Barrett’s Grove, Stoke Newington by relatively little known architects Groupwork + Amin Taha. 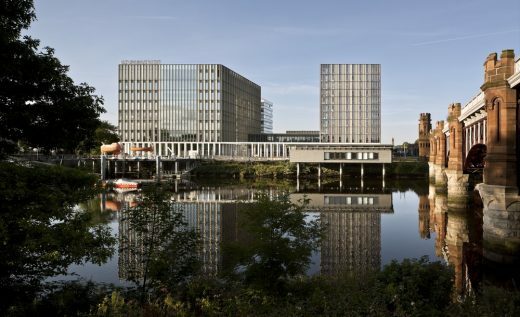 Rogers Stirk Harbour + Partners, dRMM, Reiach and Hall and Michael Laird Architects have all had previous nominations for the RIBA Stirling Prize, but only Rogers Stirk Harbour + Partners have won it. Now in its 22nd year, the RIBA Stirling Prize, is the UK’s most prestigious architecture prize. The winner of the 2017 RIBA Stirling Prize will be announced on Tuesday 31 October at the Roundhouse, London. The AJ notes that, “among the biggest surprises are the omissions of Foster + Partners’ Maggie’s Centre in Manchester, Marks Barfield’s i360 in Brighton and Herzog & de Meuron’s Tate Modern extension in London”. 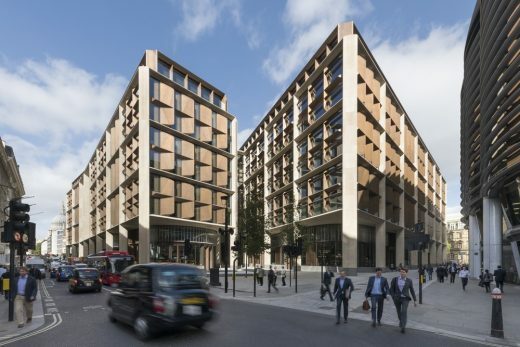 I’d suggest this is not the most stellar Stirling Prize shortlist, I feel there are two buildings that might win: Blavatnik School of Government or Newport Street Gallery, Vauxhall. Comparing these is like comparing a Bugatti Veyron to a Jensen Interceptor (give me the latter any day, but with a mechanic on tap! ): Blavatnik is sumptuous and sophisticated whereas Newport Street Gallery is a little more rough and ready, less solipstic, more focused on what it contains perhaps. 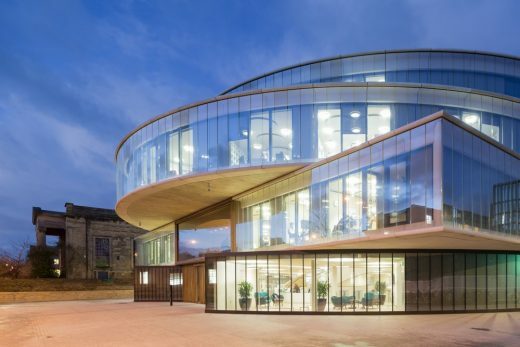 I think Blavatnik School of Government is the likely winner, don’t think I’m swayed by the betting odds published in summer (no longer seem to be online, curious), as it is a novel building by one of the world’s most celebrated architecture practices. Last year’s winner was considered to be political, the school might have been awarded purely on merit but there was a discussion about giving the government a shot across the bows for stopping their BSF school procurment route. A private house has never won the Stirling Prize which might rule out the Outhouse! City of Glasgow College, Weston Library and Trafalgar Place are all well crafted buildings but the Stirling Prize tends to go to striking buildings like the Scottish Parliament. Still, in 2012 The Sainsbury Laboratory, Cambridge won, and its beautifully rational facades are reminiscent of the City of Glasgow College, Riverside Campus. I’ve not had the pleasure of visiting this building (ref Tom Dyckhoff ‏@tomdyckhoff) but oozing from the pictures is an overall feeling that these architects know materials and furthermore know how to handle them. In a way the textured brick, stone and gentle wood tones are the antithesis to the Serpentine Sackler Gallery unveiled this week to much controversy. I find them easy to relate to, indeed they strongly appeal to me. I’m sure I’m not alone, but realise so much of architecture appreciation is ultimately subjective. 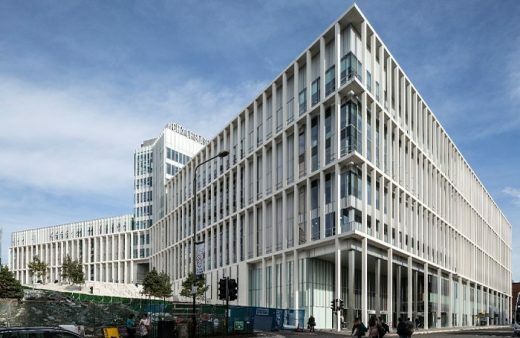 Still the architects have clearly won over both the critics and the public, winning both the BBC popular vote and the actual Stirling Prize (judged by critics). The mix of old and new is very appealing to many (the sort of thing you hear on Grand Designs or Escape to the Country!) but it isn’t always easy to get right. I’m sure the architects had fun on this project and I’m glad that this is possible to work with our heritage without going overboard and getting too sensitive and prissy about details. Although this year’s Stirling Prize shortlist wasn’t the strongest ever, Witherford Watson Mann are clearly a practice to watch. Of course this vote will have no impact on the Stirling Prize judges’ verdict. This vote closed at 16:30 BST on 25 Sep 2013. More than 65,000 votes were received. The event starts on Thrusday 26 Sep at 7.45pm with the presentation of the awards in the Platform Theatre which will last for approximately an hour. The host is architect and broadcaster, George Clarke. Presentations will be at 9pm. The shortlist for the prestigious 2013 RIBA Stirling Prize for the best new building has been announced today (Thursday 18 July). Six exciting and exceptional buildings will now go head to head for architecture’s highest accolade from the Royal Institute of British Architects (RIBA). The 2013 RIBA Stirling Prize shortlist features the vibrant reinvention of a 1960s Sheffield housing block Park Hill; the bar-raising suburban Essex housing development Newhall Be; a contemporary new holiday home within the burnt-out shell of the 12th century Astley Castle; the highly original and beautifully crafted Bishop Edward King Chapel; the dramatic and monumental Giant’s Causeway Visitor Centre and the sculptural yet economic University of Limerick Medical School and student housing. This year’s RIBA Stirling Prize shortlist features some ‘fresh’ architecture talent – five of the six practices are on the list for the first time, beating-off competition from previous winners including Sir David Chipperfield and Dame Zaha Hadid. It is also the first year in the prize’s 18 year history that half of the shortlisted firms have women at the helm: Alison Brooks Architects, Grafton Architects and heneghan peng. 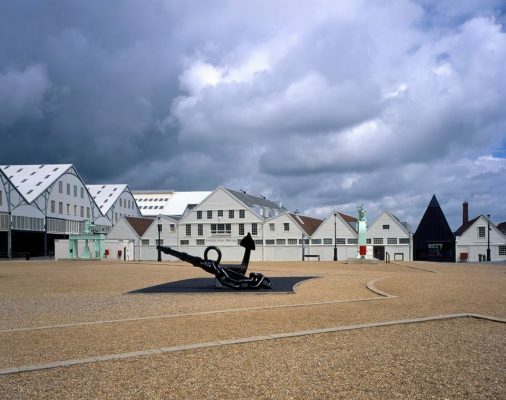 Breaks the mould of the traditional visitor centre that tends to hide from the limelight or make a statement, this highly imaginative and sculptural piece of ‘land art’ offers visitors an experience that is physical and interactive, like the causeway itself. Having ‘tuned in’ so perfectly to the environment, the visitor centre acts as the perfect prologue for the main event. Reinvention of the loved and loathed Grade II* listed 1960s housing estate. The structure of the building remained in place whilst key features were changed – interior layout, windows, security and much more. It stands as a beacon for imaginative regeneration, quality mass housing and the bold reuse of a listed building. 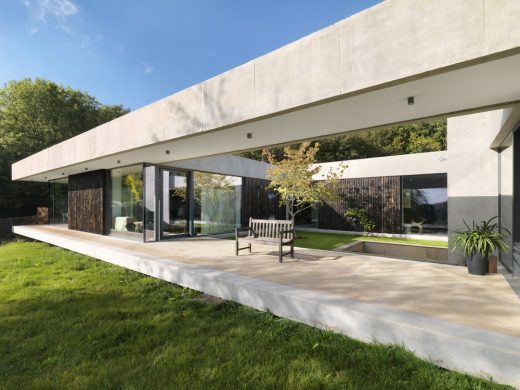 The radical re-thinking of the shape and interior of the UK house is tackled masterfully with these 84 new homes in suburban Essex that clearly illustrate that good design quality and committed developers can transform peoples’ lives. A new model for British housing? Beautiful contemporary Landmark Trust holiday home installed in the ruined walls of a 12th century manor. Unique example of the recovery of an ancient building – it is a prototype for a bold new attitude to restoration and reuse. Exceptional example of how to create a vibrant new public space through the careful design and placement of buildings. High-quality, beautiful and dramatic buildings that punch far above their rock-bottom budget. An uplifting spiritual space of great potency that the client has described as ‘what we dreamed of but didn’t think we would get’. An incredible showcase for modern British craftsmanship. The six shortlisted buildings range dramatically in size and purpose, but all will be judged by the same criteria: their design excellence and their significance to the evolution of architecture and the built environment. 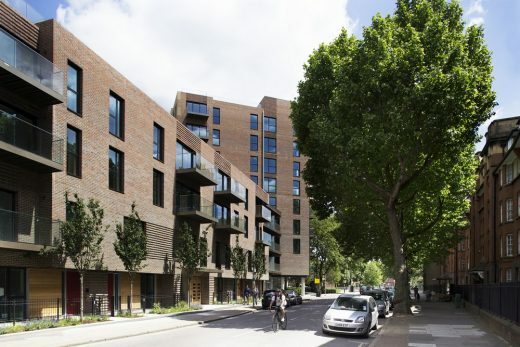 Housing is a key highlight of the shortlist, with the projects at Newhall Be and Park Hill offering two very different answers to the quality and quantity crisis of British housing. They both show that with vision, careful-crafted design and a committed developer, great things really can be achieved. The question of how to re-use historic listed buildings is boldly answered twice, with Park Hill and Astley Castle, both Grade II* listed. Challenging the traditional ideas of conservation and restoration, the architects have creatively re-invented these buildings within their existing structures, with astounding results. The Giant’s Causeway Visitors’ Centre worked within the constraints of a UNESCO site and Area of Outstanding Natural Beauty, to create something that also rose far above the expectations posed by its challenges. Exquisite detailing abounds in all six projects, perhaps most potently in the Bishop Edward King Chapel in Oxfordshire whose rich stone façade and timber interior provide some of the best examples of craftsmanship the judges have seen for some time. Attention to detail has also transformed Limerick Medical School’s simple teaching and study areas into rich, theatrical spaces – all on an incredibly modest budget (€1,220 per sq m). Angela Brady, RIBA President, said: “The RIBA Stirling Prize is awarded to the building that has made the biggest contribution to the evolution of architecture, and nowhere is the need for fresh-thinking needed more than in housing. 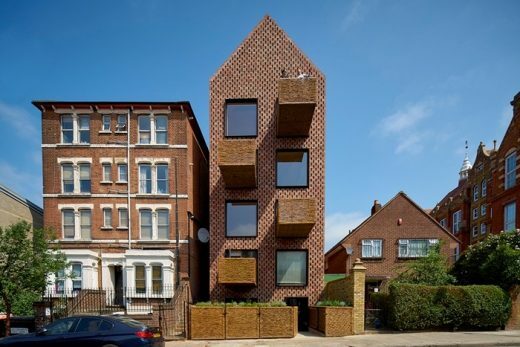 The UK is blighted with unimaginative, poor quality houses that people don’t want to live in but have little other choice, so I am delighted to see two amazing and highly original housing projects on this year’s shortlist. These projects show how when talented architects and clients work together and focus on quality, affordable and desirable new homes can be created. They shine a light on what the future of UK housing can be. 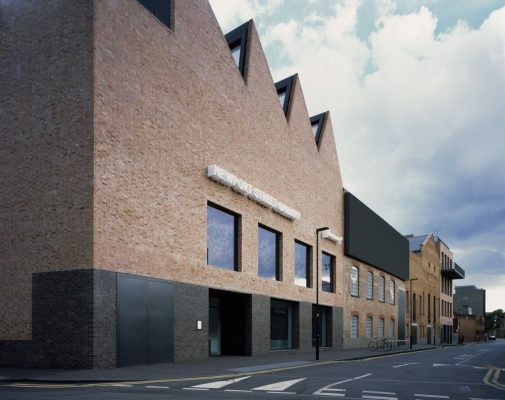 The winner of the RIBA Stirling Prize will be announced on the evening of Thursday 26 September at Central Saint Martins, King’s Cross, designed by last year’s RIBA Stirling Prize winner Stanton Williams. The 2013 RIBA Stirling Prize judges who will visit the six shortlisted buildings and meet for a final time on the day of the presentation (26 September) to pick the winner are: Stephen Hodder – architect and RIBA President Elect (President: 01/09/13; Sheila O’Donnell – architect, O’Donnell + Tuomey; Paul Williams – architect, Stanton Williams; Dame Vivien Duffield – philanthropist and Chair of the Clore Duffield Foundation; and Tom Dyckhoff – journalist and broadcaster. Previous winners of the RIBA Stirling Prize include: Sainsbury Laboratory by Stanton Williams (2012); Evelyn Grace Academy (2011) and MAXXI Museum, Rome (2010) both by Zaha Hadid Architects; Maggie’s Centre at Charing Cross Hospital, London by Rogers Stirk Harbour + Partners (2009); Accordia housing development by Feilden Clegg Bradley Studios/Alison Brooks Architects/Maccreanor Lavington (2008); The Museum of Modern Literature, Marbach am Neckar, Germany by David Chipperfield Architects (2007). The hotly anticipated winner of the 2012 RIBA Stirling Prize for the best building of the year, was announced Saturday 13 October, at 9pm a special event in Manchester hosted by BBC Radio 4 presenter Mark Lawson. The RIBA Stirling Prize, now in its seventeenth year, is the UK’s most prestigious architecture prize. Last year’s winner was Brixton’s dramatic Evelyn Grace Academy by Zaha Hadid Architects. The Olympic Stadium topped The Guardian newspaper’s poll of Stirling prize shortlisted buildings. The seemingly simple yet highly innovative London Olympic Stadium, the thoughtful and intimate Maggie’s Cancer Centre in Glasgow, the stunningly original Hepworth Wakefield gallery in Yorkshire, the beautifully detailed and rule-breaking Sainsbury Laboratory for plant science in Cambridge, the New Court Rothschild Bank in London that rises high whilst opening new views at street level, and the crafted and careful reincarnation of the Lyric Theatre on a small suburban site in Belfast are all in the running for architecture’s highest accolade and a £20,000 prize from the RIBA. 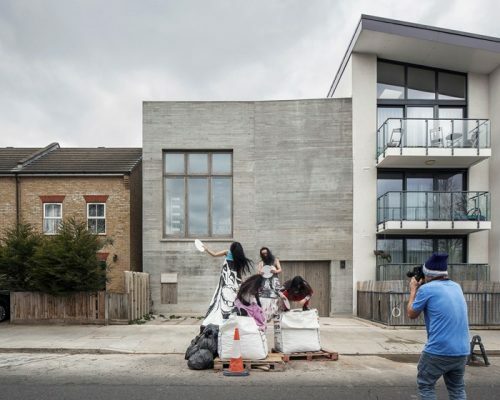 Who will win the Stirling Prize 2012? Looking at the Jury e-architect’s guess is that it will be between The Hepworth and The Sainsbury Laboratory. 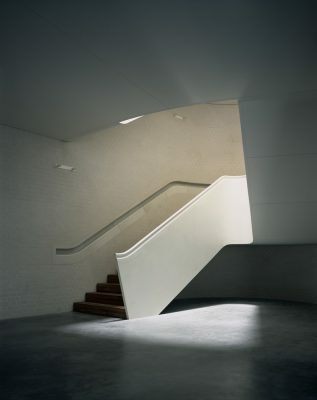 Given that exuberant buildings by Zaha Hadid Architects have won the last two Stirling Prizes, beating David Chipperfield Architects’ Neues Museum in 2010, there are two factors that might sway the Jury towards austere The Hepworth, which is designed by David Chipperifled Architects. We don’t see the Olympic Stadium being chosen by this Jury, though with Sir Nicholas Grimshaw as chair there is a slight chance. Maggie’s Centre London won in 2009 which might make another one less likely to win?